News from the recent mashup event held in Canberra under the GovHac banner finally started to filter though. 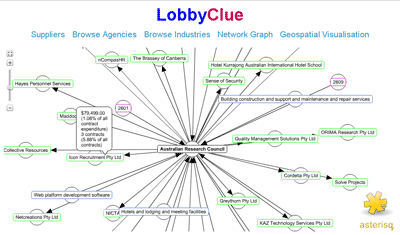 The overall winner is Lobbyclue, a Flash based application attempting to visualise complex tangle of government suppliers and contracts with individual Departments. There is also has a mapping component, built with OpenLayers and OpenStreetMap API, but is very slow to load. 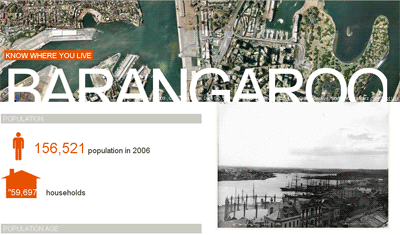 Know where you live: stylish snapshots of population statistics from ABS and some crime statistics (for postcodes in Sydney area only). What the Federal Government Does: tag cloud and network diagram of different functions of the government and its various departments (concept only). 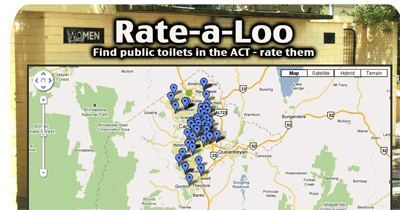 Rate A Loo: shows the location of public toilets in the ACT - along with some descriptive data, and allows users to rate the condition of public toilets and comment. Overall, there are 13 projects listed on GovHac. Unfortunately, I could not get some of them to work so, I reserve my further comments. Although, there were a few potentially interesting submissions. You can find links to most of them on the GovHac wiki page. The disappointing bit was - no, not that I missed out on the closing ceremony but - lack of participation from commercial operators and larger companies. The event was dominated by amateurs. Don’t get me wrong. It is good that individuals are able to present fresh ideas on potential use of government information but the real breakthrough cannot be achieved without active involvement of IT/GIS industry leaders. However, to secure that participation organisers would have to provide some tangible commercial benefits – like publicity, contacts and/or prospects of big money for specific projects… Neither appears to be available for now. Organisers are planning GovHack Canberra Encore on November 11 2009, 4:00pm - 5:00pm to show several submitted applications to a larger audience so, I will have another chance to see it first hand.